That Empty Lot Problem? Solved. - Archpaper.com That Empty Lot Problem? Solved. While the recession has put a damper on development along San Francisco’s Octavia Boulevard, the mayor’s office has reached out to Douglas Burnham of Envelope A+D to come up with something cool to temporarily fill the two vacant lots that front Hayes Green at the intersection of Octavia and Fell. Burnham’s plan sounds like a lot of fun. 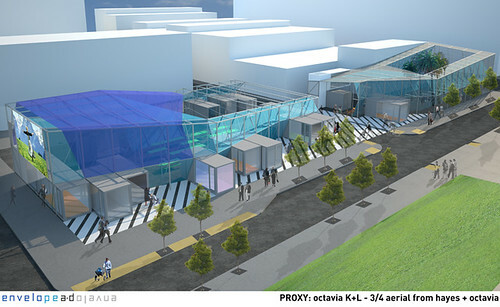 He plans to transform the space into a mini-shopping, dining, and entertainment destination called PROXY–using a series of modular units that will be recyclable in two or three years when things ratchet up again. 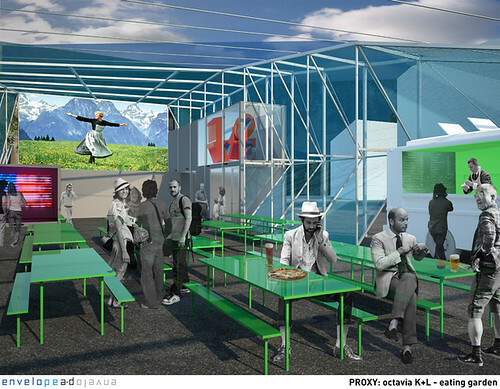 The vision includes a group of pop-up stores, a food court served by “slow food” carts, an art gallery, and a courtyard for projecting outdoor movies. Design-wise, the spaces will make their transient nature apparent, revealing their infrastructure (e.g., wiring, water storage) and their modular assembly. We know what those contrived shopping-n-dining plazas feel like (to wit: Santana Row), so we can’t wait to see what happens when you have an architect as the prime mover. With buy-in from the city and from the neighborhood association, Burnham plans to put things in place this spring. See below for an idea of what will replace a parking lot and a bunch of weeds. How inspiring is that?